The new ES2800 optical mark reader (OMR) from Kendata Peripherals scans information directly from forms into a computer at speeds of up to 2800 pages per hour, providing a level of accuracy and efficiency unattainable through conventional keyboard data entry. Productivity is further enhanced by the ES2800's built-in 150-sheet capacity automatic document feeder and a special output mechanism that allows forms to be sorted to different locations during the scanning process, according to operator-defined criteria. Providing an ideal means of speeding up data collection in a wide variety of applications, the ES2800 is inherently accurate because it eliminates key entry errors, and this accuracy is further enhanced by continuous, automatic calibration of the read heads and by the use of adjustable mark sensitivity levels. Designed for maximum ease of use, the new OMR incorporates features such as an LCD panel displaying the current status of a scanning job, built-in intelligence allowing automatic translation of mark information into data compatible with application programs, and the ability to store and recall form definitions even when the unit has been switched off and on again. The ES2800 can read form sizes from 5.7 x 15.2cm to 21.6 x 35.6cm, printed on paper ranging in weight from 90 to 148gsm. The unit itself has overall dimensions of 79 x 36 x 15cm and weighs 7.7kg. 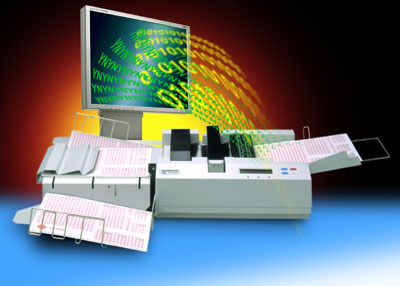 Optional facilities include twin read heads to enable the OMR to read double-sided forms in a single pass, a built-in printer for printing text or serial numbers on forms for easy identification, a bar code read head, and menu-driven utility software allowing the user to create form definitions.